How Do Computer Monitors Affect the Environment? Where Can I Recycle a Broken Television Set? If your TV no longer works—perhaps its one of the analog sets that were phased out when America went digital—you probably want to get rid of it to free up shelf space and make room for a new model. 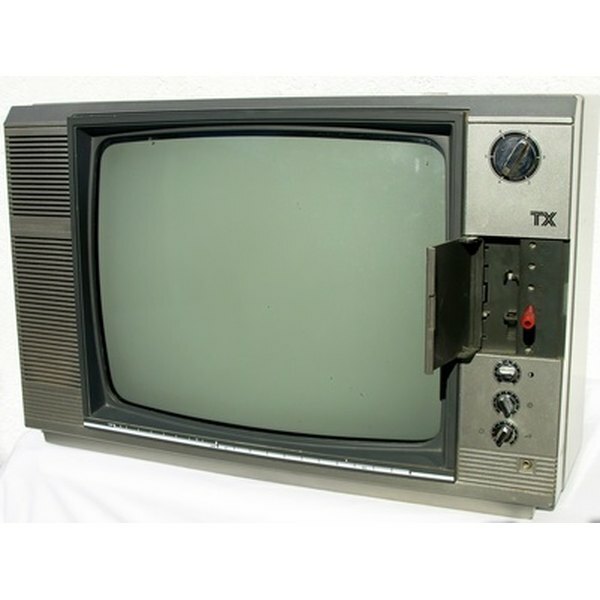 To do your part as a responsible citizen, recycle your old set; doing so will ensure the toxic materials inside your TV don’t leach into landfill runoff, and will also provide raw materials for reuse, conserving energy and natural resources that would have been needed to create new plastics and metals from scratch. According to the U.S. Environmental Protection Agency, the lead, steel, aluminum and steel components can all be recovered through recycling. Big box stores like Best Buy and Office Depot often accept any brand of TV for recycling. Best Buy, for example, accepts TVs of up to 32 inches. It charges $10 for this service, unfortunately, but will give you a $10 gift card for the store to offset the cost. If your TV is a Samsung, the maker will accept old TVs at no cost at specific locations; others will be accepted by the maker for a fee. Panasonic, Sharp and Toshiba have a similar program of recycling locations that accept their branded televisions for free recycling, and LG, Zenith and GoldStar brands offer free recycling as well. Research LG and Waste Management electronic drop-off locations to find a site near you. Check with your town, city or county solid waste management body to find out where collection sites for electronic waste like computer monitors and televisions are located. Some may have periodic electronic waste drives. According to Maine’s Department of Environmental Protection, most places that accept computer monitors will accept televisions, too. If your county has a standard drop-off location available for hazardous waste, chances are it will accept your TV. Curbside collectors generally don’t pick up TVs during residential curbside garbage collection because of concerns over contamination, but your curbside collection service provider might be able to point you to a hazardous waste collection location or another local option. When you drop off your TV, ask the recycler where the machine will be sent as recyclable scrap. For example, many times recycling is carried out in countries like China and Ghana with low de facto monitoring of the health and safety conditions of the workers who smash the obsolete devices to remove profitable metals, risking breathing noxious toxins in the process. If you learn your recycler ships to such countries, as a responsible global citizen you should keep searching for a recycler who isn’t willing to export the health risks of recycling to scrap metal recyclers—often children—who are desperate for money in developing countries but put at great risk by this industry practice. Environmental Protection Agency: Where Can I Donate or Recycle My Old Computer and Other Electronic Products?